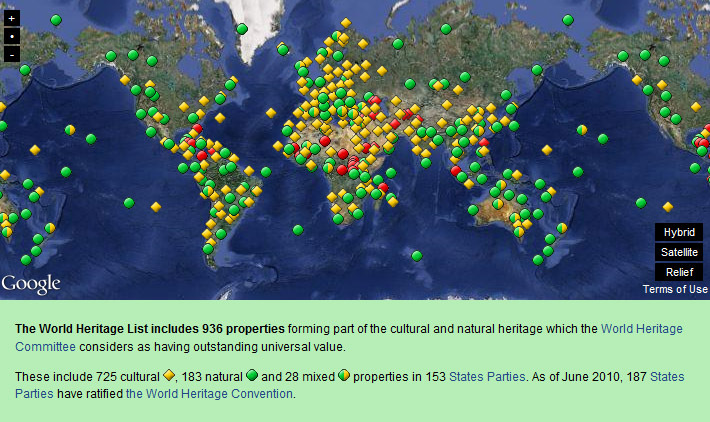 The United Nations Educational, Scientific and Cultural Organization (UNESCO) maintains a list of World Heritage Sites. I am sure there is some degree of preservation and esteem that comes from being on this list, but I look at it as a venerable To-Do List! There are 936 sites which span from natural landscapes to ancient structures to fragile ecosystems. You can play with the interactive map here. Doing a quick count, I’ve seen 31 sites (yay) which is 3.3% (sad). In the Nice to Meet UNESCO feature, I’ll be profiling individual sites. Maybe we won’t get through all of them, but it will be fun to try! UPDATE: You can see all the UNESCO Heritage Site post by clicking “Recurring Features” above in the menu bar.